Archbishop John Nienstedt will ordain seven men from the St. Paul Seminary to the transitional diaconate beginning at 10 a.m. Saturday, May 7, at the Basilica of St. Mary, 88 N. 17th St., Minneapolis. This ordination is a major step on the way to the priesthood, and enables the men to preach the homily during Mass, among other ministerial rights. Three men studying for the Archdiocese of St. Paul and Minneapolis will be ordained transitional deacons: Evan Steven Koop, Benjamin Robert Little and Nicholas William VanDenBroeke. The four men of the Diocese of Navrongo-Bolgatanga in Ghana to be ordained are: Kevin Apatewen Abakisi, Robert Awinsobid Abotzabire, Peter Winimi Akudugu and Albert Bawe Wugaa. The ordination Mass, which is open to the public, will be followed by a reception. For perhaps the first time ever, the St. Thomas Academy Corps of Cadets marched in rank April 26 for a formal Spring Review before both Archbishop John Nienstedt and Adjutant General of Minnesota Maj. Gen. Richard Nash. Family, alumni and community members were also in attendance at the Mendota Heights school. 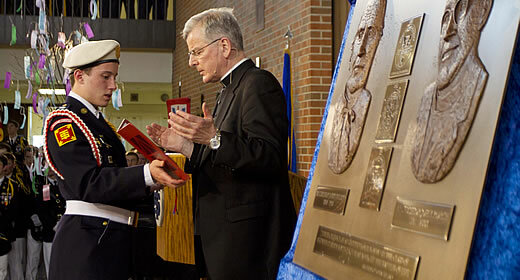 This culminating event in the school’s year-long 125th anniversary celebration also included the unveiling and dedication of a bronze relief sculpture of the academy’s founder Archbishop John Ireland and longtime headmaster Archbishop John Roach. St. Croix Catholic School in Stillwater will welcome Dominican Sister Mary Juliana as principal for the 2011-2012 school year. The Sisters of the St. Cecilia Congregation in Nashville, Tenn., arrived at St. Croix Catholic in 2002; however, Sister Mary Juliana will be the first sister to serve as principal, said Father Michael Miller, pastor of the Stillwater churches of St. Michael and St. Mary and canonical administrator for the school. St. Hubert in Chanhassen and Holy Family High School in Victoria will celebrate the generous gift of the Heritage Edition of the St. John’s Bible during a special event from 1 to 3 p.m. Saturday, May 7, at St. Hubert, 8201 Main St. The event includes workshops on sacred art, calligraphy, Scripture and a presentation from St. John’s on the 14 year process of calligraphy, illustration and illumination, along with special activities for children.